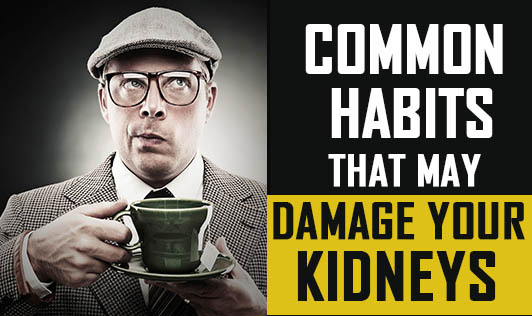 Kidneys are important organs that help filter waste products from the blood. They play a key role in not only filtering the blood and getting rid of waste, but also balancing the electrolyte levels in the body, controlling blood pressure, as well as stimulating the production of red blood cells. Infrequent Urination: When we leave the bladder full for an extended period of time, different complications in the urinary tract may arise, such as Hydronephrosis which is caused by chronic back pressure on the kidneys, eventually resulting in renal impairment. Drinking Inadequate Amounts of Water: When we are not properly hydrated, renal blood flow decreases resulting in accumulation of toxins in the blood. Consumption of Too Much Sodium: When we eat excess salt, the kidneys are kept busy by excreting sodium which may cause long term stress on the kidneys. Consumption of Too Much Caffeine: Caffeine can elevate blood pressure, and high blood pressure can strain the kidneys, which can damage them. Too much of Alcohol: Too much alcohol intake can damage the kidneys, as alcohol contains toxins which put stress on the kidneys, damaging them eventually. Don't ignore symptoms like change in the colour of your urine, change in urine volume, increase in night urination, as well as high blood pressure. Contact your doctor at the earliest!